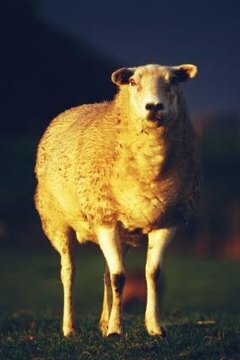 Everyone recognizes the sheep with its fluffy coat as a main producer of wool. However, milk produced by the ewe, or female sheep, is also a commodity that has gained popularity. Sheeps' milk has a variety of uses and benefits that other types of milk, such as cow and goat, do not offer. Milk from sheep offers several nutritional advantages. For instance, it has a higher content of protein, vitamins A, B, and E, calcium, potassium, and magnesium than cow's milk, according to the Sheep 101 website. Also, sheeps' milk may be frozen and stored up to a year and still produce cheese, unlike other milk. However, the fat and calorie content is also higher than other milk making it richer. Some people with lactose intolerance find drinking sheeps' milk more tolerable, since it has higher percentage of small fat globules, the Hobby Farms website claims. The most common use for sheep milk is cheese-making. Feta and Ricotta are made from sheeps' rich, thick milk. Additionally, sheeps' milk contributes to some ice cream and yogurt varieties. Although sheep milking systems exist, most sheep are milked daily by hand. The most common dairy sheep is the East Friesian. An ewe of this species generally produces 990 to 1,100 pounds during lactation, which lasts between 220 and 240 days on average. Sheeps' milk only makes up about 1.3 percent of total world milk production. While milking sheep is a practice that has taken place for thousands of years, it is relatively new to areas of the United States and Canada. Since the early 1990s, approximately 100 sheep farms have popped up in the United States. Even with the growth in popularity of sheep milk farms, the United States still continues to import over 60 million pounds of sheep cheese a year from countries like France and Europe.